Do not leave any objects (screwdrivers, tools, etc.) on the seat during seatback repair. It can lead to personal injury if the side air bag should accidentally deploy. Handle the side air bag module carefully. During disassembly, always hold the side air bag module, do not let it hang by the wire harness. Always work from the side or back of the seatback assembly, do not work in front of seat. 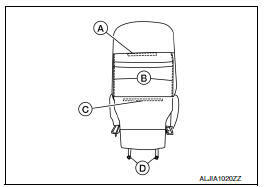 Do not use air tools or electric tools for servicing the seat assembly. Replace the side air bag module if it has been dropped or sustained an impact. Do not insert any objects into the side air bag module. Do not attempt to disassemble the side air bag module. Do not expose the side air bag module to temperatures exceeding 93В°C (200В°F). Do not expose the side air bag module to any oil, grease, detergent or water. 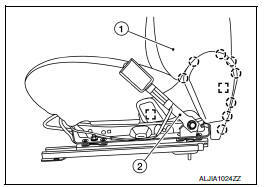 During disassembly, do not damage the seatback board, chutes, connectors, retainers, clips, module harness or the side air bag module. 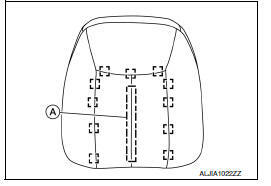 If the vehicle has been involved in a collision and the side air bag module has deployed, the seatback pad and seatback trim must be replaced. Remove the front seat assembly. 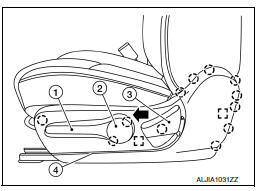 Refer to SE-18, "DRIVER SIDE : Removal and Installation - Seat Assembly". Unzip the seatback zippers (B), then release J-hook retainers (C) and (A). Unclip the side air bag harness from the seat frame assembly. Take note of harness routing and attachment location for accurate installation. Disconnect the harness connector from the seatback heater (if equipped). Remove the seatback assembly from the seat frame assembly. Release the headrest holder locks as shown and remove the headrest holders. 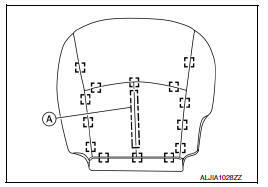 Before removing/installing the headrest holder, check its orientation (front/rear and right/left). Remove and discard the side air bag module nuts (A). Do not reuse the side air bag module nuts. Disengage the side air bag module studs from the seat frame assembly and lift the seatback trim and seatback pad as an assembly from the seat frame assembly. Separate the seatback trim from the seatback pad. 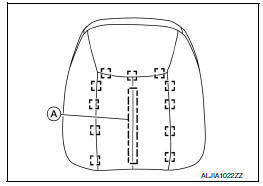 Open the seatback trim and release the side air bag module studs (A) from the holes in the chute (B). 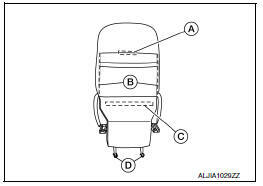 Pull the side air bag module (1) out of the chute (B) and remove from the seatback trim. Do not strike the side air bag module. 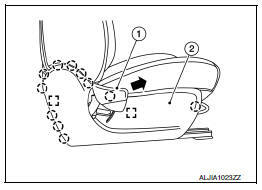 Remove the hog rings, release the hook fastener (A) and separate the seatback trim from the seatback pad. Inspect seatback pad, seatback trim and seatback trim chutes. Replace if damaged. Smooth out all wrinkles during assembly. Always route side air bag module harness in original location. Replace any deformed or damaged clips with same type and color. Always install clips in the original location in the harness. After work is completed, check that no system malfunction is detected causing the air bag warning lamp to illuminate. 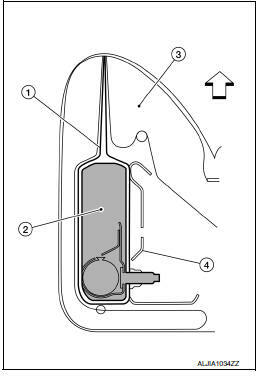 If a malfunction is detected by the air bag warning lamp after repair or replacement of the malfunction parts, perform the SRS final check. Refer to SRC-17, "SRS Final Check". 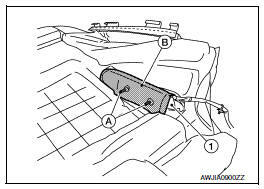 When installing the side air bag module, make sure the side air bag chute (1) is pulled over the outboard surface of the side air bag module (2). Make sure there are no wrinkles and the chute is not folded, twisted or pinched. Tighten the side air bag module nuts to specification. 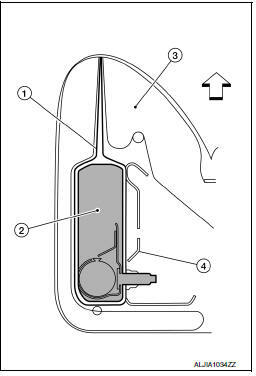 Refer to SE- 26, "DRIVER SIDE : Exploded View".
) to ensure the hook fasteners below the seatback trim are fastened properly. Ensure hog rings are correctly fastened around both the seatback trim and seatback pad wires. Use NISSAN standard hog rings and tools to assemble. Do not leave any objects (screwdrivers, tools, etc.) On the seat during seat cushion repair. It can lead to personal injury if the side air bag should accidentally deploy. During disassembly, do not damage the seatback cover, chutes, connectors, retainers, clips, module harness or the side air bag module. Remove the seat cushion outer finisher (LH) (4). Release pawls and remove the lift lever finisher (2). Remove two screws and the lift lever (1). Release pawl and remove the recline lever (3) as shown. Release pawls and pull to release the metal clips. Remove the seat cushion outer finisher (RH) (1). Remove the seat belt buckle (2) and position aside. Refer to SB- 8, "Removal and Installation". Remove the seat cushion trim (1) and seat cushion pad as an assembly. Release j-clip retainer (a) from the seat frame assembly. Release j-clip retainer (b) from the seat frame assembly. Release J-clip retainer (D) from the seat frame assembly. Release retainer strip (c) from the seat frame assembly. Disconnect the harness connector from the seat cushion heater (if equipped). Remove the seat cushion trim and seat cushion pad as an assembly from the seat frame assembly. Remove the hog rings, release the hook fastener (a) and separate the seat cushion trim from the seat cushion pad.
) to ensure the hook fasteners below the seat cushion trim are fastened properly. Ensure hog rings are correctly fastened around both the seat cushion trim and seat cushion pad wires. Before servicing the side air bag module, turn the ignition switch off, disconnect both battery terminals and wait at least three minutes. 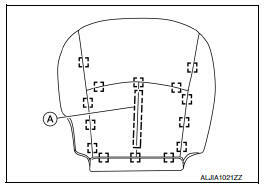 If the vehicle has been involved in a collision and the side air bag has deployed, the front seatback assembly must be replaced. 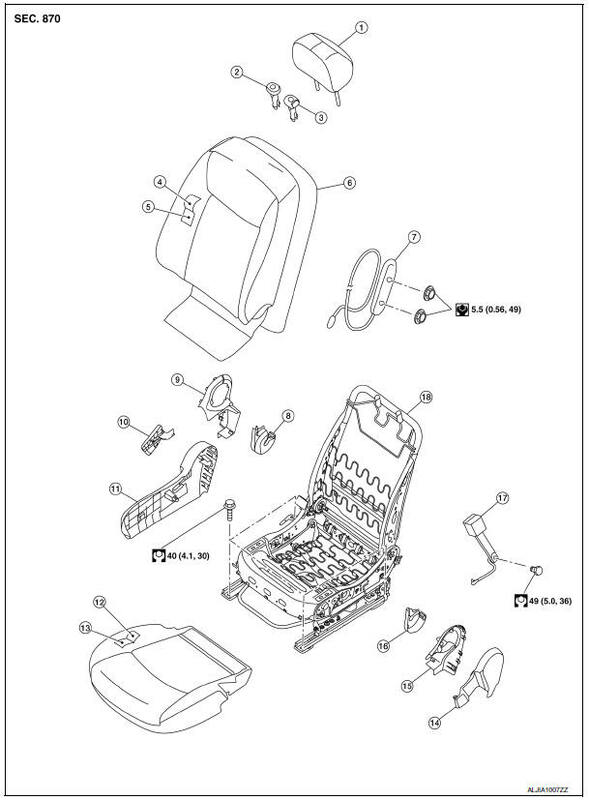 For side air bag module removal and installation, seatback trim and seatback pad must be removed. Unzip the seatback zippers (B), then release the J-hook retainers (C) and (A). Unclip the side air bag module harness from the seat frame assembly. After installation is completed, check that no system malfunction is detected causing the air bag warning lamp to illuminate. Remove the front seat assembly. 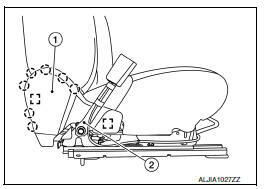 Refer to SE-20, "PASSENGER SIDE : Removal and Installation - Seat Assembly". Release the lower seatback trim retainer straps (D) from the seat frame assembly. 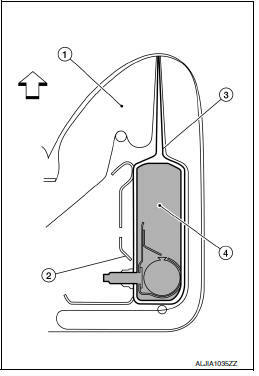 When installing the side air bag module, make sure the side air bag chute (3) is pulled over the outboard surface of the side air bag module (4). Make sure there are no wrinkles and the chute is not folded, twisted or pinched. 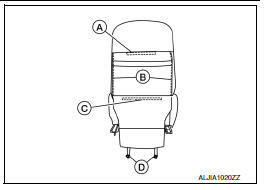 Tighten the side air bag nuts to specification. Refer to SE-35, "PASSENGER SIDE : Exploded View". Remove the seat cushion outer finisher (rh) (2). Release pawl and remove the recline lever (1) as shown. Remove the seat cushion outer finisher (lh) (1). Always route seat harness in original location. Replace any deformed or damaged clips with same type and color. Always install clips in the original location in the harness. 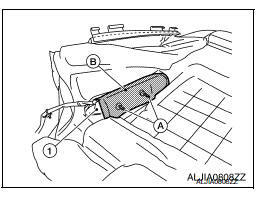 If the vehicle has been involved in a collision and the side air bag module has deployed, the front seatback assembly must be replaced. Tighten the side air bag module nuts to specification. Refer to SE- 35, "PASSENGER SIDE : Exploded View".